Gary Cooper joins the foreign legion in Beau Geste. The Stars: Gary Cooper, Ray Milland, Robert Preston, and Brian Donlevy. Source Material: The 1926 silent film starring Ronald Colman, which was based on P.C. Wren's 1924 novel. 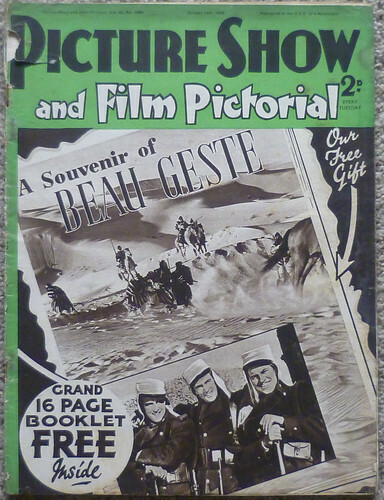 A souvenir booklet for Beau Geste. Awards: Nominated for two Academy Awards: Brian Donlevy for Best Supporting Actor and Hans Dreier and Robert Odell for Art Direction. 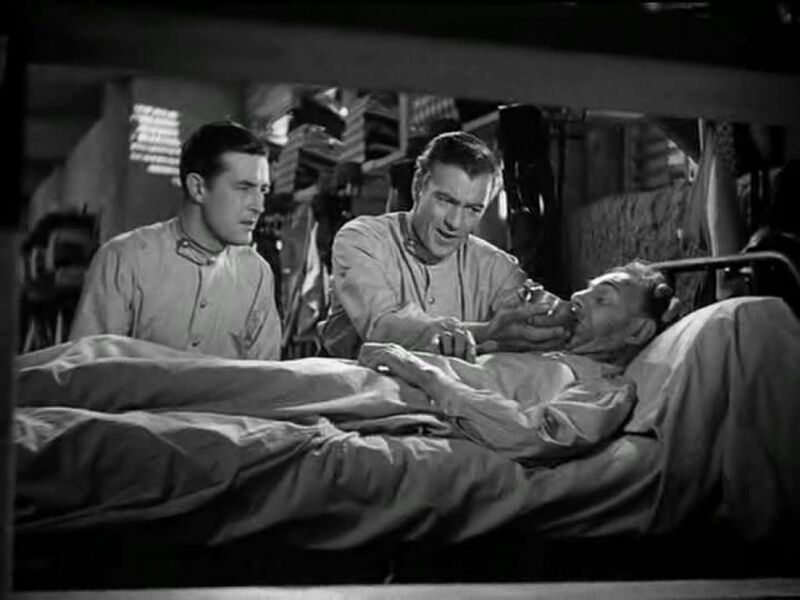 The Plot: Three English brothers (Cooper, Milland, and Preston) join the French Foreign Legion where they come under the control of a sadistic sergeant (Donlevy). Backstory: The 1926 film version of Beau Geste was one of the biggest hits of the silent era, kicking off a craze for foreign legion films that continued into the early 1930s with hits like Morocco (1930), Beau Ideal (1931), and Under Two Flags (1936). By the late 1930s the genre was mostly played out, with legion films being either B movies or comedies (both Laurel and Hardy and The Three Stooges joined the legion). The legion had become such an easy joke that many critics expressed surprise when Paramount Pictures executives decided to make a sound version. Paramount executives were looking for a lavish spectacle for their first Technicolor feature (they later dropped that idea because of the expense of location shooting), so they decided to revive one of their greatest hits and cast their biggest star in the lead (Cooper already played a legionnaire to great success in Morocco) for box-office insurance. 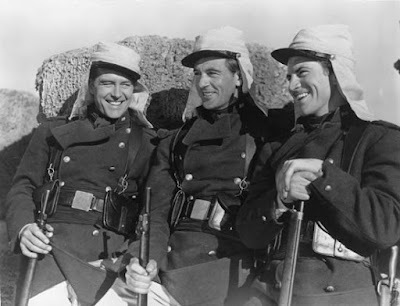 Brothers John (Ray Milland, left), Beau (Gary Cooper), and Digby Geste (Robert Preston) relax on duty in Beau Geste. Best Performance: Brian Donlevy as Sergeant Markoff. Beau Geste has a quite a few good performances despite the fact that the accents are all over the place (Cooper never abandons his Western drawl while playing an English gentleman). Donlevy is sensational as a Russian sergeant who thrives on cruelty. His sadistic smile every time he gets to inflict another punishment is unforgettable. Best scene: The first scene is a fascinating set-up for the rest of the movie. Best Line: "The love of a man for a woman waxes and wanes like the moon, but the love of brother for brother is steadfast as the stars and endures like the word of the prophet," and Arab proverb that opens the film. Donald O'Connor: Beau Geste includes a few scenes of the brothers as children. Beau is played by a young Donald O'Connor who would later become one of old Hollywood's great dancers in films like Singin' in the Rain (1952). O'Connor was under contract at Paramount from 1937 through 1940. He appeared in several films including Sing, You Sinners (1938) and Tom Sawyer, Detective (1938). Ray Milland (left) and Gary Cooper give an ill legionnaire some water in Beau Geste. Location Shooting: Beau Geste was filmed in Buttercup Valley, Ariz., about 19 miles west of Yuma. Paramount built an entire city around the desert location with 136 tents for housing and a movie theater. There was even an airplane taxi service from Hollywood to Arizona so executives could come and go at their leisure. Fun Fact: The first preview screening of Gone With the Wind was held in a theater that was supposed to be showing Beau Geste. 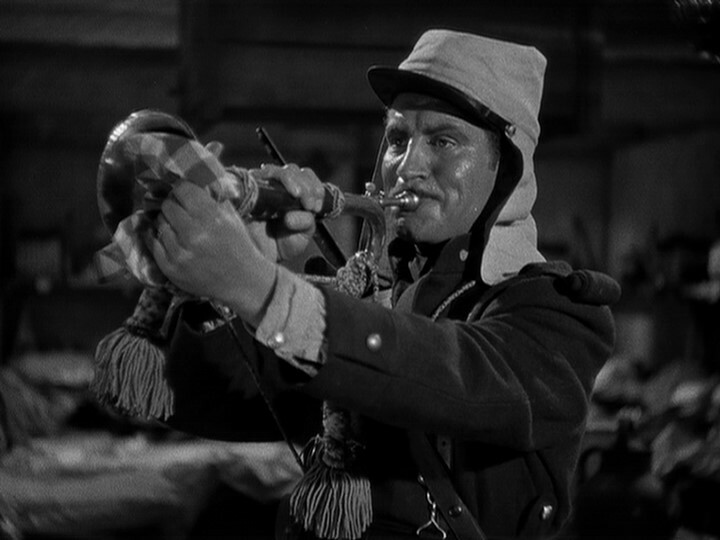 Digby Geste (Robert Preston) plays taps in Beau Geste. Why it's essential: Beau Geste is one of the great action-adventure films of the 1930s, although in recent years it's been overshadowed by another great 1939 action movie, Gunga Din. What makes Beau Geste so compelling is it's unique structure. The first hour of the film sets up several central mysteries -- What happened at an eerie fort guarded only by dead men? Who stole a priceless sapphire? Why did the company bugler disappear? -- that are answered in the fascinating last hour of the movie. The structure of Beau Geste is actually quite groundbreaking and set the tone for movies like Citizen Kane and the film noir genre that revolve around a central mystery that isn't solved until the final reel. Availability: Beau Geste is available on DVD and video on demand. Next week, the essentials will take a break so we can lounge on the French Riviera with a look at To Catch a Thief (1955) for the Beach Party Blogathon.